2017 Northborough-Southborough Night at the Cannons - our 14th annual year! 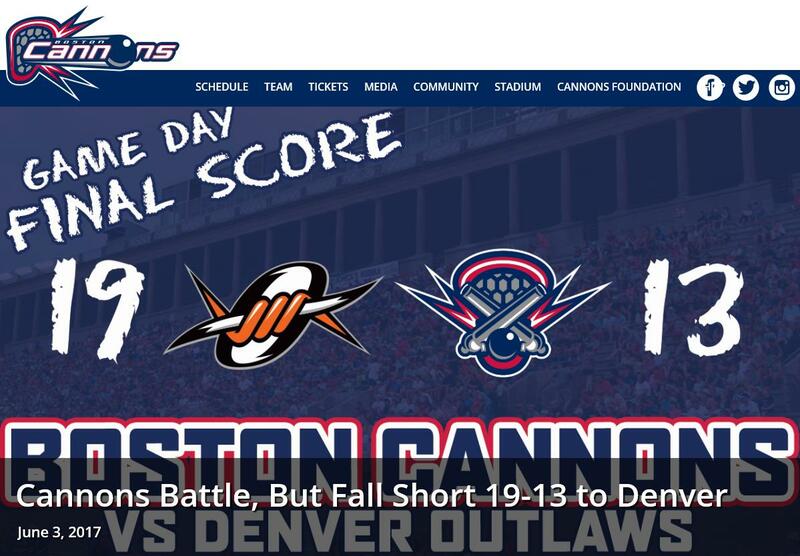 Boston, Massachusetts (June 3, 2017) – In a close game throughout the first three frames, the Denver Outlaws pulled away in the 4 th quarter going on a five-goal run resulting in a 19-13 win in the Cannons Fighting Cancer game. For the fourteenth year the Cannons hosted the Northborough-Southborough Youth lacrosse program, with the Tomahawks bringing 150 fans to the game to join the other 4,846 Boom Squad supporters at Harvard. The Toamahwks players had the chance before the game to have a private Meet & Greet with Captain Will Manny and Defenseman Rob Haus. Max Seibald tied the game at 12-12 early on in the 4 th quarter but the Outlaws took over right after that. Seibald scored his 25 th career two-point goal on the night and had his second straight game with a pair of them. Kevin Buchanan had his best game of the season with four points. Will Manny and Justin Turri also had four points apiece on the night. Zach Currier, the 6 th overall pick by the Outlaws out of Princeton University finished the night with one goal and two assists in his debut. Eric Law had five points in the game and led the way for the Outlaws alongside teammate Wes Berg who contributed four goals and an assist. The Cannons defense held the MLL leading goal scorer, Michael Bocklet, to just one goal in his worst game of the season. The two top faceoff men in the country, Cannons Joe Nardella and Outlaws Thomas Kelly had intense battles at the x throughout the night. 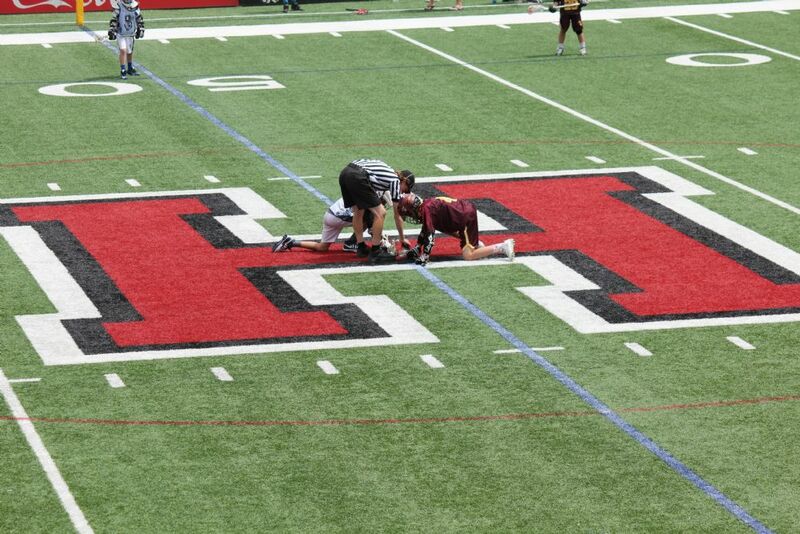 Kelly won the battle 18 to 16 in a very physical ground game. Outlaws goalie Jack Kelly got the best of the Cannons offense as he continues his case as the best goalie in the game. The Cannons lost the ground ball game by scooping 38 ground balls to the Outlaws 42 on the night. Another close part of the game was the turnover differential in which the Cannons turned it over nine times and the Outlaws turned it over on eight possessions. The loss tonight ends the Cannons four-game home stand and they travel to Ohio to take on the Machine next Saturday in a tough three game stretch that features the Machine twice and the Outlaws again. - “They played really hard. Denver had the ball a lot of the game and they were controlling the faceoff for a lot of it and our defense played really tough,” said Coach Quirk on the Cannons defensive performance. - “I’m just focusing on how I can fit in on this offense and what they need me to do. That’s primary and secondary is defense and how they match up against us,” said second round pick Eric Scott on his season debut.